The 1933 DeLong Gum baseball card set was originally released in 1933 and featured 24 of the biggest stars of the time period. 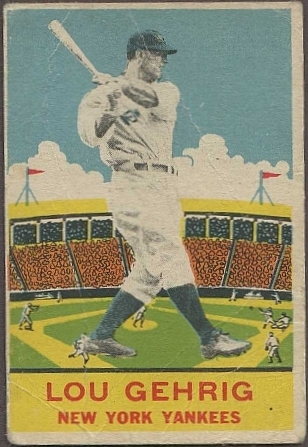 One of the most prominent players in the set was #7 Lou Gehrig. At the time, Gehrig was in the middle of his career. The Yankees had just won the 1932 World Series over the Chicago Cubs in a decisive four game sweep. For his part, Gehrig had batted .349 in the 1932 regular season. The DeLong Gum series is the only one released by the DeLong Gum Company of Boston. Of the 24 cards in the series, an incredible 15 players are now in the Hall of Fame. The cards do not have a player biography on the back, but instead have baseball tips written by Austen Lake, the editor of the Boston Transcript, a daily afternoon Boston newspaper. 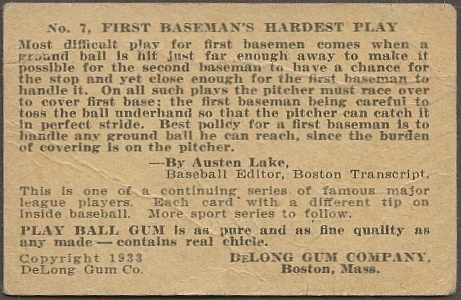 The cards are occasionally mistaken for a Play Ball set because they have the phrase "Play Ball Gum is as pure and as fine quality as any made -- contains real chicle." The DeLong Gum Company had no affiliation with the Gum, Inc. Company, which was based in Philadelphia and would not released its first set until 1939. Please click here to view the #7 Lou Gehrig DeLong Gum baseball card. Please click here to view our DeLong Gum reprint cards.